Sukumar shows difference between wife and Tamannah! Sukumar, the maverick director of Telugu Cinema, decided to produce films on his Sukumar Writings production banner and his second film as producer, introducing Hari Prasad Jakka as writer-director and Arjun Bandreddi has hero, Darshakudu is releasing tomorrow. In the trailer of the film, the main character says, directors think very selfishly and use anything and everything they can in their films, even their personal memories. 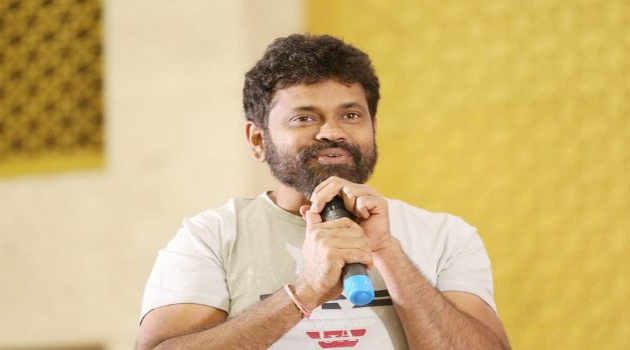 When asked if directors in real life are so selfish, Sukumar replied to that question with a big, "Yes" and he went on to say, " One day my asked me tag along with her in shopping and I went to please her. She showed me bunch of sarees and asked which one is good. I told her i like them all and take what you like. We ended that shopping in 2 minutes. But the same me, thought for one whole day about what kind of saree should Tamannah wear in 100% Love! That's how selfish about my movie and that's the difference between work and normal life." He clarified that there is no truth to the rumours that story of Darshakudu has been written by him and he also said that he never went on set for even a day while the film was shooting. Well, his previous production Kumari 21F got an initial opening because he wrote the story and screenplay, also as his friends Ratnavelu and Devi Sri Prasad worked for the movie. Darshakudu doesn't have any such attraction and with many big movies slated for release next week, we have to wait and see, how much will the common audience show interest on this low budget flick!